1. Is Now a Good Time to Buy? Recent events over the last four weeks with the sharemarket plunging 4% in one day, downgrading of the US credit rating from AAA to AA+ and talk of world recession, means consumer sentiment continues to remain depressed. Interest rates haven’t moved since November last year and the next movement is likely to be downwards – some analysts are tipping a 1% decline. The Reserve Bank is changing its tune on how much global financial impacts are having on Australian demand. “I’m just waiting to see what happens”……”There’s just so much uncertainty in the economy I’ll just sit on my hands for the moment”….”Property prices will surely go down - people just can’t afford more debt”. These are some of the many comments we hear every day in speaking with investors and home buyers. In the property market, things are generally tough…..tough for sellers that is. It’s mostly a buyers market out there with larger numbers of listings and fewer buyers. We are seeing prices going sideways in most areas and the occasional bargain buy. So is it really a good time to buy? And when is the optimal time in the property cycle to buy? To help answer this question lets look at the worst case scenario – What is the probability of making a loss when you buy a property? 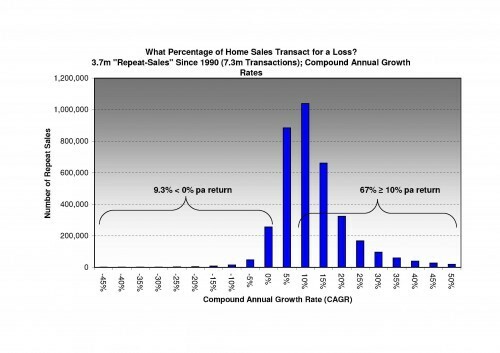 Respected market commentator Christopher Joye from Riskmark asked his research team to analyse the percentage of home sales over the last 21 years to find out the average annual capital growth rate. The period of time since 1990 gives a very strong sample size covering approximately 3 property cycles - with many up and down periods. The research shows that out of 3.7 million purchases and sales (ie 7.3 million transactions) only 9.3% made a capital loss in gross terms. Compare this to the incredible 67% of people that received a compound capital growth rate of 10% per annum or more. And 24% earned at least a 5% pa return. This profound data points out some important conclusions. Two thirds of property buyers made a net return more than three times the average inflation rate (2.9%) over the same period. Take history as a precedent, there is a 90% chance your property will rise in value, and 10% chance it will fall in value over the next two decades. It is critical to select property in suburbs that will outperform the average, ie not grow at just a mediocre 5% pa but at least 10%pa. During property downturns, most vendors choose not to sell and hang on to their property and wait for the market to improve. This puts a “floor” under property prices ie residential property is typically far more resilient to financial shocks than sharemarket investing especially where leverage is used. During the GFC in 2007 to 2008, the average capital city house price decline from peak to trough was only around 3.8% (a far cry from the 30% to 40% drops that some share prices suffered). My observation of the market is that we are at or very close to the optimal time to buy. There is a critical difference between doing property “searching” and true property “research”. Research = Buying with your head. True research takes an incredible amount of time to collate and analyse data. To be a successful property investor you will need to look at between 50 to 100 properties in an area to get a real sense of the market. You have to ask yourself if you spend more time planning your annual holidays than you do researching your next home or investment property. True research is about finding out the key price drivers in an area, the demographics, who’s moving in and who’s moving out. Which streets are in most demand, the local attractions, the variation in median price over the last 10 years, how many repeat sales and total sales in the suburb. As you get more sophisticated as an investor, you will also be considering key factors like vacancy rates, auction clearance rates, land content, uniqueness value, infrastructure, potential supply shocks from new developments, stock currently on market, days on market, vendor discounting, population growth and historical price growth. There are several data providers where you can buy all this type of data and then spend months analysing it…..or our team of property experts can help you identify the best locations and those you must avoid. You see we have bought close to 1000 properties for our clients over the last 10 years and because we negotiate property deals on a daily basis we know the best price to secure the right property. Our hundreds of testimonials and over 19 industry awards make us the most trusted property acquisition specialists in Australia to help you grow a property portfolio without the risks of going it alone. Sandra and Andrew were looking to purchase their first investment property and looking for a lifestyle area that would be appealing to tenants. We looked and numerous properties in the inner west and Surry Hills area. They are both busy professionals and with a young child did not have the time or expertise to research the property market. We secured a property prior to auction in Darlinghurst in a boutique development (5 units) with a sunny north facing balcony, city views and in a residential street within walking distance to numerous restaurants/shops and the city. The property was being sold with vacant possession and we managed to negotiate a rent increase with the current tenant to stay on after settlement which meant no re-letting fees and no down time for income (5.3% gross return). This type of property is highly sort after as it is in a small block (not in a high rise) - so it was not so much about getting a massive discount as about securing a well positioned and unique property for strong capital gain.